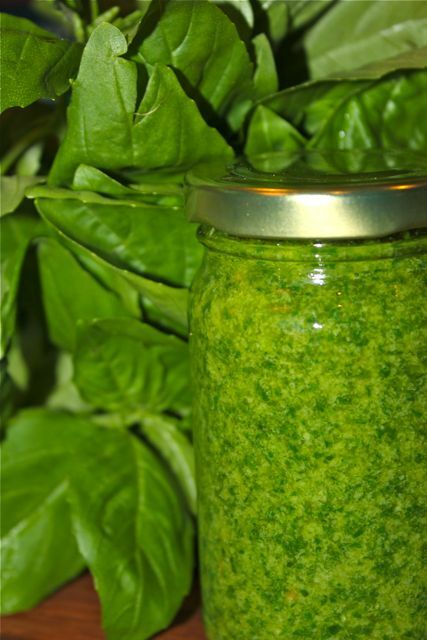 Ever wonder why your homemade pesto turns a really unappealing dark green or near black color? Actually, I rarely make pesto in the Philippines, as I tend to find most if not all fresh basil here to have a really grassy taste, rather than the typical “sweet basil” taste of basil grown in more temperate environments. Not sure if it is the intensity of our tropical sun, the soil its grown in, or what, but basil here is less than ideal for pesto, in my personal opinion. I read an article once that even in Italy, the finest basil pestos are made with little “baby” basil leaves, from plants that are just say 5-6 inches in height when cut, and more often than not, grown in greenhouses. That’s a nice, ingredient centered way to start the sauce, but I have never found such leaves in the local markets. However, every once in a while, I find really fresh and attractive bunches of basil and despite previous disasters, try once again to make a decent pesto. Such was the case today, when I spotted stunning looking basil at the Salcedo Market, for PHP30 for each robust bunch. I bought three bunches and hoped for the best. Back at home, I decided to try a trick I had heard/read about and quickly blanched my basil leaves in boiling water for ten seconds and then plunged them immediately into an ice bath. Made the pesto with blanched and toasted pili nuts instead of pine nuts as I had a lot of the former in stock, and a touch of lemon juice, garlic, salt and extra virgin olive oil blitzed up in a food processor. 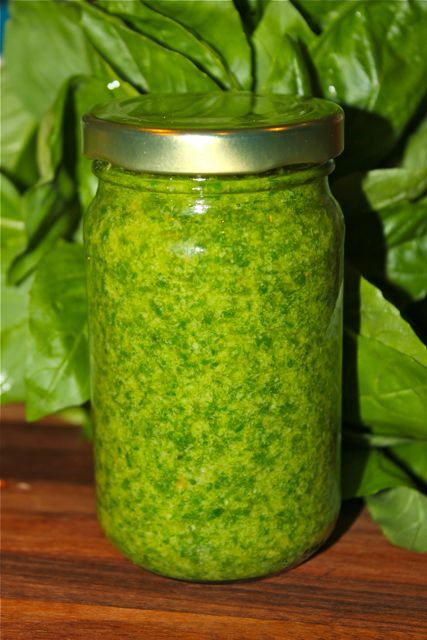 The resulting pesto was the most vibrant green I have ever made at home! Incredibly fresh and appetizing. It still tasted a bit medicinal, but better than most other versions I have made so far. I decided to bottle a portion for future use and stuck it into the deep freeze after putting a layer of oil on the surface of the sauce to seal in the goodness and hopefully preserve some of the color. Meantime, I made another batch for immediate use. Add the grated parmesan to the sauce before mixing with the pasta (do not freeze sauce with cheese already in it). So the the quick tip is… blanch your basil and shock them in an ice bath before proceeding with your recipe! woohoo, nice tip, thanks, MM! i’ve stopped making pesto precisely because of the unappetizing dull gray-green it becomes. i make mine with toasted walnuts. have just made fresh yougurt cheese (no science to it really, i just drained a batch of yogurt overnight over a cheesecloth-lined sieve, over a bowl in the fridge), and am planning to make some pesto to mix with it, for a pesto-cheese spread. no hardship in making fresh yogurt either – i just heat up half a liter of milk )even low-fat UHT will do) just until tiny bubbles appear on the sides of the pan, cool it for 5 minutes, stir in 2-3 tbsp, plain yogurt (even the local nestle’ creamy yogurt will do), put the whole thing in a clean glass jar, put the lid on when it’s cool, and leave it on the kitchen counter overnight. the next morning, i have thick, fresh yogurt. if you want thicker yogurt, drain it over a cheesecloth-lined sieve for about 3 hours. and i always save 3 tbsp. of yogurt to make the next batch. it’s great with your kalamansi jam! I have made pesto a couple of times in the past. I grow my own basil and there was a time that they simply grew out of control that there was no recourse but to make pesto and freeze them or else all the basil will go to waste. I made mine without blanching and shocking the leaves. I also make the pesto a few hours after I have just harvested the fresh young leaves using freshly roasted pine nuts, olive oil and garlic. After processing, I put them in small containers good for three to four servings of pasta and I simply place a piece of plastic wrap on top of the pesto so it is not exposed to air. I then deep freeze the containers. Thus far, I have been able to successfully freeze pesto for up to six months with out discoloration. Sad that my BASIL was wiped out during ONDOY before I could get cuttings and replant! Yummy vibrant green. Off to the side: I have never been stymied by a set of poll options until now. An impediment of choice. Time to turn my attention to making yogurt after successive trials to turn out edible looking taho never mind ever attaining my grail, a silky taho poised between the textures of crème brûlée and a wiggly blancmange. I know what I should do, just use my caramel sauce on the yogurt. Connie C wondered in a comment a few moons ago what exactly the herb called in Southern Tagalog “balanoy” might be. It’s the native basil. wow, caramel sauce on yogurt, why didn’t i think of that before? add a shower of crushed pili or almond brittle! footloose, this week, i’ve been hooked on yogurt-honey drink – (somewhat like indian lassi) : just fill a glass 2/3 full with yogurt, add a tablespoon of honey, top up with water and ice and stir. or substitute the water with orange or mango juice…very refreshing! you can experiment with the proportions that you prefer. back to basil (sorry, MM)..would “balanoy” be the same as the visayan “sangig”? Wow, thanks for great tips. Simply beautiful! what a glorious green it turned out to be–beautiful! I love experimenting with different nuts in my Pesto, home made toasted almonds are yummy but my current favorite is pistachio nuts. Mmm mmm good! Have to get my hands on some pili nuts and see what that’s like! Cheers! In my house pesto tends to get gobbled up before discoloration gets a chance to occur. But once when I did have a large batch I froze it in ice cube trays then stored the cubes in several freezer bags for separate servings. Once thawed it was still bright green. I toast the nuts first, too, before using them in my pesto and also add fresh lemon juice. Have you ever tried using pistachios? I use a combination of both pine nuts and pistachio for a nuttier quality to the sauce. Your pesto looks great. I’ll try blanching the basil next time to preserve the color. Footloose, have you read Andrea Nguyen’s Asian Tofu? There is a recipe for Tofu Pudding which I’m pretty sure is taho. The ingredients are few: soy milk, water, gypsum and tapioca flour. I wouldn’t know where to get ahold of gypsum though, or even what it looks like! @Josephine, Yes, but holding off on using tapioca because I look on it as cheating. Gypsum is plastic of Paris. Same stuff used in casts for bone setting and artistic modeling but serves (in controlled quantities) as coagulant in making taofu. I get them here in Chinese food shops alongside other wholesome-sounding food additives such as borax and lye. Footloose, I suspect your insides are cleaner than my bathroom, though I’ve been scrubbing it all afternoon. MM, why should the cheese not be added before freezing? Thanks! Good to know, MM … thanks! I bet your pesto would be great with the aforementioned deep fried pork ribs and lamb…delish. I’ve heard it said that when a basil plant “bolts” (grows a long stem vertically and and starts to flower) then the flavor of the leaves changes/gets bitter. The “bolting” mechanism is probably a survival reaction and happens when it gets too hot/the soil dries out so it tries to spread it’s seed and propagate itself. re locally produced basil, i agree with you. however, i lived in Cambodia for about 7 years and i used their local basil when i made my own pesto. it resembled the ‘baby basil’ you described but these are grown locally. i found them too sweet so i often mixed it with the purplish basil (i think it’s Thai or Vietnamese basil) that was also available locally. and yes, i read in one my internet searches for keeping the pesto green that a solution was blanching the leaves. i tried it and it worked! thanks for sharing this–it reminded me of my good life in Cambodia. Thanks, MM. I’ll try blanching the leaves and leaving out the cheese next time I make and freeze pesto. I like freezing pesto in ice cube trays in the summer for use in pesto pizzas in the winter. I try to harvest basil leaves early in the morning. I heard that the leaves are most flavorful harvested at that time. I also pinch the tips off the growing ends to promote bushiness, prolong harvesting and delay flowering. Thanks for the tip MM. Is there any special way you remove the water from the leaves after blanching and shocking? Was it the size, color, or shape of the leaves that you liked? If it was the size, like how many inches long and wide? I am guessing that these leaves that you liked are from a young plant more or less one foot high, and probably only until the second harvesting. The young leaves have a nice umbrella-like shape (even for the larger leaves) , while leaves from older plants get more flat. Mart, I noticed that they usually start to flower and seed after 2 to 3 months. Unless, as you mentioned, the plants are unduly stressed, and the survival instinct to seed takes over earlier. The flowering can be suppressed by cutting back aggressively. But the flowering still comes soon after, and the leaves start becoming thicker and smaller (I suppose even the flavor becomes stronger and more “medicinal”). Have you guys tried gathering the seeds from the dried pods and placing them in your summer drink? When wet, a sago-like gel covers the black seed , and lends an exotic look and flavor to iced tea and other drinks. You can extract the seeds by rubbing the dried pods against a fine-screen strainer. Thanks for the tip! I always keep a stash of pesto in the refrigerator for pasta or for canapes. Just add tome tomatoes and top with Laguna kesong puti. Gej, yes, and they look like frogs’ eggs! MM, thanks! On to trying this size out! More seeds will be used up. Re age – we’re all probably closer to cheese and wine! Millet – oo nga! The way you they look like when one finds frog’s eggs strung in a pond or stream – though many might not find this appetizing – ha! Ahh so that is how it is done. I just finished a bottle of homemade pesto and noticed that it did turn dark, dark green. Thanks for the tip! Is the lemon optional? How does it improve the pesto? This is the first time I read of including lemon juice, will give it a try on my next batch of sauce. hi marketman i tried this and the results as you said were marvelous!!! ialso added some malunggay leaves which i blanched and put in an icebath as well. needless to say the dish was decimated as soon as it hit the table. thanks for the tip!!! !